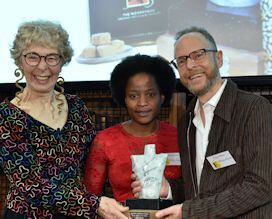 Congratulations to all 30 winners of this year’s Free From Food Awards www.freefromfoodawards.co.uk . 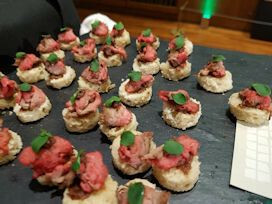 The winners were unveiled at a glittering Awards presentation in front of an audience of 300 guests at London’s Royal College of Surgeons www.rcplondon.ac.uk , presided by Michelle Berriedale-Johnson and Cressida Langlands, organisers of the Awards. The overall winner was Booja Booja www.boojabooja.com with its “Wonder Box” of truffles which are free from dairy, gluten and soya. The company also won gold in the Free From Gifts category. 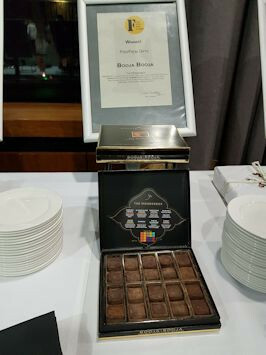 It was highlighted by judges as being “an amazing selection of unusual and distinctive flavoured truffles – fabulous quality and a lovely creamy texture.” The box comprises eight different truffle varieties such as Toffee Strudel, Rhubarb & Vanilla Fool, Cherry Cognac, Fine Champagne and Honeycom Caramel. This triumph is timely as the company celebrates its 20th anniversary this year. The FAIR trophy (a sculpted torso of a Greek god, also known as ‘Marble Mo’), was presented to Colin and Sithabile Mace of Booja Booja by Michelle, director of the Awards. It has been awarded to the overall winner of the Free From Awards since the first ceremony in 2008, when Booja Booja won Gold for Hunky Punky Chocolate Dairy Free Ice Cream. This year the company also won a gold Award for its new chocolate truffle flavour Honeycomb Caramel, while its Dairy Free Hazelnut Chocolate Truffle ice cream scooped a silver Award in the Milk Alternative category. After the announcements, a buffet was served comprising all the winning products, which was a real treat. It was a fantastic experience to not only see the products first-hand, but also to have the opportunity to taste them. I can say that Booja Booja’s truffles were truly delicious and mouth-watering. Newcomer Bellygoodness www.bellygoodness.com was joint Gold winner in two categories for its Nomato Sauce - in the “Best Product from a Start Up” and in the ‘No Top 14’ category. This means the product doesn’t contain any of the 14 allergens (see footnote at the end of the blog). The company was created by two mums and daughters (Francesca Griffin, Gail Robertson, Pauline and Charlotte Lea) combining their skills as nutritionists and creative cooks. Nomato Sauce doesn’t contain onion, garlic, tomatoes, dairy, gluten, yeast or added sugar. Other sauces in the range include curry, chilli and white sauces. Chef Akila Ltd www.chefakila.com scooped several awards for its gluten free home-made Indian meals, some of which are vegan and all made from organic ingredients in Yorkshire. It was joint Gold Winner not only for its Vegan Tikka Masala in “Best Product from a Start Up”, but also its Mum’s Chicken Biriyani in “Meaty and Fishy Ready Meals” and for Lentil and Vegetable Curry in the “Veggie Ready Meals”. Among the supermarkets, Tesco www.tesco.com won Retailer of the Year for the fifth successive year. Asda www.asda.com , Marks and Spencer www.marksandspencer.com and Aldi www.aldi.co.uk were all represented. 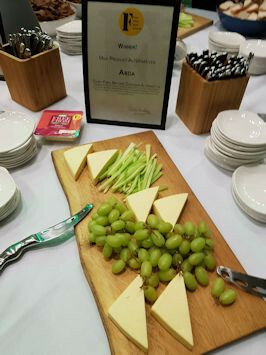 I was impressed by Asda’s dairy free mature cheddar cheese – absolutely delicious. This was just one of the gold winners from the “Milk Alternatives” category – Asda also won gold for its Long Life Oat Drink in the same category. 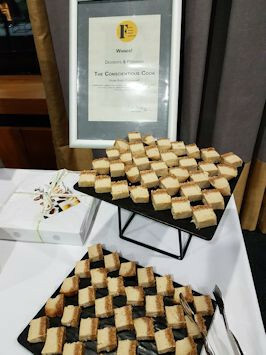 Other discoveries included the luscious Baked Vegan Cheesecake from The Conscientious Cook, http://www.theconscientiouscook.co.uk/ one of the Gold winners in the “Desserts and puddings” category. Other tantalising dishes included the Raw Mince Pie from Liberty Loves www.liberty-loves.co.uk . This is gluten free, dairy free and contains no salt or sugar. Another outstanding cake is Marnie Searchwell’s gluten free Vegan Mocha Chocolate Cake www.marniesearchwell.com , with its soft, moist sponge filled and frosted with vegan cream cheese and chocolate. Both products won Gold in the “Tea Time” category. 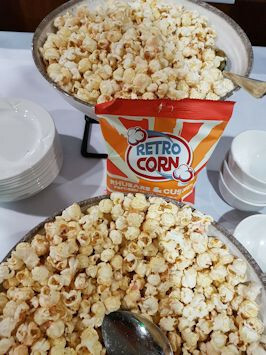 A more unusual product was Retrocorn’s Rhubarb and Custard Popcorn www.retrocorn.com – very moreish. This was one of the Gold winners in the “Confectionery and Chocolate” category. 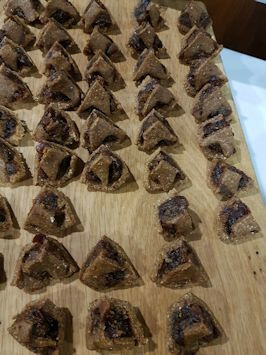 It was a delight to indulge in the free from canapes served during the presentation, especially as they were all labelled so you knew exactly what was in them. Out of habit, I found myself automatically asking whether there was any gluten in them and loved the reply “There isn’t gluten in anything”.